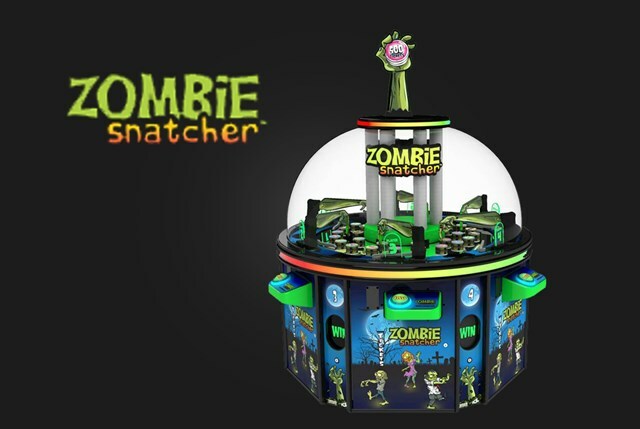 The long-awaited redemption game, Zombie Snatcher manufactured by ICE as a partnership with Toccata gaming will be rolling out to Dave & Busters locations everywhere very soon. If the game is not yet in the D&B location you most frequently visit it should be there very soon. This game is part of the Dave & Busters Summer of Games promotion. The promotion lets you have 4 free plays on a select list of games (one play on one game each) with a Power Card charge of $10 or more. Coupons can be used in conjunction with this promotion. Zombie Snatcher was supposed to have a nationwide release earlier this summer however manufacturing issues held its release back a bit. Zombie Snatcher is a 6-player Zombie themed rotary game where you have to knock chips with various ticket values into slots on the game’s playfield. Other games that qualify for Dave & Busters summer of games promotion are: Mario & Sonic at the Rio 2016 Olympic Games Arcade Edition, Star Trek Arcade (Coin Pusher), Star Wars Battle Pod, Quik Drop, Crossy Road Arcade, Grand Piano Keys, Typhoon Simulator, Galaga Assault & Ghostbusters Arcade.